﻿ Best Price on Buena Onda Hostel in Roatan Island + Reviews! 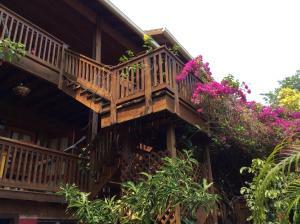 Buena Onda Hostel is located in the West End of Roatán, a short 5-minute walk from the beach. It has an outdoor movie area, plus BBQ facilities and free Wi-Fi. This hostel offers spacious dormitory rooms with wooden décor, lockers and a private bathroom. It also features a double room with modern décor and a ceiling fan. Guests can use the shared kitchen from 7:00 until 22:00, and restaurants are available within a 10-minute walk. The property has a games room and a TV area, and the popular West Bay Beach, which offers bars and outdoor activities, is only a 10-minute walk from Buena Onda Hostel. Juan Manuel Galvez International Airport is 7.5 mi away. A deposit via PayPal is required to secure your reservation within 24 hours. The property will contact you with instructions after booking.